Iverson. Fourth Edition. The best beginning wine book that we have read now in its fourth edition. Includes chapters such as All About Oak, MaloLactic Fermentation, Fermentation Variations, Trouble Shooting, and Concentrate Kits. Also includes descriptions of grape varieties. Best, easy to read and understand for the beginner winemaker or as a reference for the experienced. I've been making wine from grapes for over 40 years. 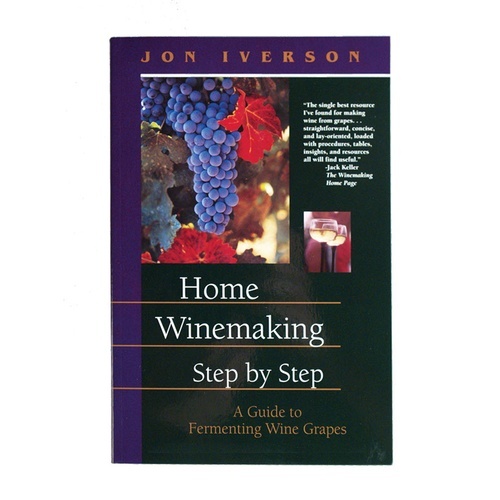 I have more than ten books for home winemaking. I buy this book for friends and acquaintances that I teach to make wine. For a convenient sized book, it is complete and easy to use. I use it as a reference every harvest for one thing or another. If you are serious, you will have this book in your library augmented by other specialty books. I bought this because they said I really needed to to make wine when I bought my kit. I felt like this was a waste of money and I didn't really need it.